Horseradish is a member of the mustard family, used mainly for its root but with tasty leaves as well. It is among the boldest flavorings used in cooking, comparable to that of some chile peppers. Horseradish “heat” attacks the senses as “fumes” waft up the nasal passages and bring tears to the eyes while oils cling to the lips and tongue. It is a favorite ingredient in a number of recipes including cocktail sauce and roast beef (in a cream/vinegar blend). “Prepared” horseradish products are more readily available than roots. These will be sold as hot, creamy, grated, and powdered. Beet horseradish is a blend of beet juice and grated root. Other additives and preservatives may also be included. Roots are typically sectioned rather than sold whole. They should be firm without any green discoloration or withering. Many products also contain small quantities of horseradish, such as specialty mustards and sandwich spreads. Keep roots in a paper sack and refrigerate. They will be good for several days at optimal freshness. Freeze in chunks or peel and grate first, then place in vinegar. Most commercial products will keep for several months. Always refrigerate if purchased cold or after opening (with the exception of powder). These typically do not freeze well. 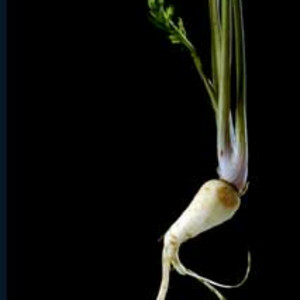 The root will begin to lose its pungency as soon as it is cut, peeled, and grated. Add vinegar immediately to create a “mild” taste or wait a few minutes for the oils to release. Flavor will dissipate when heated. Include small amounts of horseradish in deli dishes such as potato salad and coleslaw. Dill and rosemary are great herbs to pair with horseradish.